Cory Stutzman – DuMor Water Specialists, Inc.
"I live south of Goshen and have well water with a high concentration of iron in the water. My previous water softener did a pretty good job, but was not up to the task. It did not take long for the showers, etc to turn an orange/red tint. It got so bad so quick my daughter was unhappy having to use the shower, and honestly it started to look like a crime scene. I now have a softener from DuMor and things are great - the water really is softened, everything seems cleaner and no more orange! The salesman and the installation professional were both excellent! Everything went smoothly and I couldn't be happier! So far DuMor has really delivered." 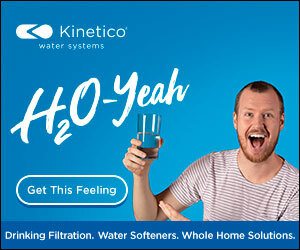 "We purchased the Kinetico water softener April 20, 2015 and really enjoy it. No more rust spots in my kitchen and bathroom sinks! No rust inside my dishwasher! The pipes in the basement don't rattle when it charges like the old softener did. I enjoy the filter on the drinking water line. I would highly recommend." "DuMor has been a joy the past ten years. A company that I have trusted for service and advice. Marshall has been very professional and helpful with his survey. I look forward to continuing our association." "Since we've had our Kinetico system we use less soap to do laundry and it seems more fluffy. Our girls hair is easier to comb. Cleaning is easier. Since we've installed Kinetico K5 R.O. system we drink more water thane we ever have. We feel more healthy. My husband's stomach seems to be less acidic. We always have plenty of water with our large family."